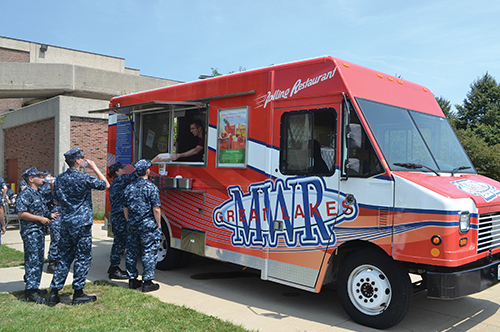 The Morale, Welfare and Recreation (MWR) Department at the Naval Station Great Lakes in Illinois utilizes its “Rolling Restaurant” to support its concession efforts on the base throughout the year. This restaurant on wheels was originally purchased in 2006 at another base for approximately $100,000. Five years later, the Great Lakes MWR acquired the food truck and installed some minor upgrades—including a customized exterior with a bright red façade that featured “MWR,” and the “Rolling Restaurant” signature. Inside, the truck sports a flat grill, a fryer, a steam table, warmers, refrigerators, a freezer, an ice bin, and plenty of prep space. In addition, the unit has a hand-wash system and three compartmental sinks to meet health and sanitation requirements. Local health inspectors routinely inspect the truck’s kitchen and general operation to ensure compliance with all applicable policies and standards. The mobile kitchen runs off of a gas generator, but also may be plugged into a 30-amp outlet, if necessary, to keep the generator running and to support the kitchen equipment (mainly a refrigerator/freezer). Almost any meal of the day, or any menu item one can think of, can be prepared and sold from this customized vehicle. Throughout the spring, summer, and fall of 2012, the “Rolling Restaurant” was utilized mainly for larger events and festivals, offering a wide variety of menu items such as burgers, tacos, Philly cheesesteak sandwiches, and more. However, the mobile kitchen was not utilized as much as it could have been that year. Early in 2013, Barry East, restaurant and club manager for MWR, proposed a new plan for the food truck as an extension of his current restaurant operation. He proposed a specific menu that offered specialty hot dogs and super side orders. The goal was to have the “Rolling Restaurant” travel throughout the base at least three times per week from April through October. Also known as the “Dawg Pound,” the restaurant on wheels has taken Great Lakes by storm in 2013. It’s nothing for the truck to go out to a location and ring up between $300 and $350 in sales in 75 to 90 minutes. But more importantly, the truck brings additional meal-time options to base personnel. The food truck continues to be used for special programs, sporting events, concerts, and various activities sponsored by the MWR department. After the “Dawg Pound” concept was created this past spring, a secondary fundraising program also was established for the not-for-profit groups on the base, as well as for local commands whose organizations use fundraising dollars to help offset command/unit picnics for active-duty military personnel and their families. Here’s how the program works: when a group reserves the “Rolling Restaurant” or “Dawg Pound” for a specific day and location, the event and the menu are promoted throughout its own distribution system. MWR assists the group only by producing the flyer/promotional piece. On the day of the fundraiser, one or two volunteer members of the designated group are on-site to assist with set-up, and/or crowd control. At the site, MWR handles all the food prep, cooking, and sales. Afterwards, the group receives 20 percent of all the sales for very little time or effort. From these fundraiser events, MWR has an opportunity to promote its “Rolling Restaurant” and also manages to make a few dollars. In the past year—when unit allocations were cut due to federal budget concerns—this fundraising opportunity really helped certain commands and units fund picnics and other morale-boosting events. Bigger plans are in the works for 2014. Working with social-media platforms, the strategy is to promote the food truck’s daily locations more frequently via a mobile text club and Facebook page. Efforts also will be made to tap into the breakfast market by early staging at key locations on the base. Finally, there will be a move to re-capitalize on some of the kitchen equipment as well as to add speakers and a sound system to draw more attention, creating an entertainment component. Like anything that has some success, the MWR will continue to develop and cultivate this mobile food-truck business. The goal now is to make the “Rolling Restaurant” a fixture at any gathering that requires some form of food service. Note: The Naval Station Great Lakes is home to the Navy’s only boot camp, and considered the quarterdeck of the U.S. Navy. Approximately 25,000 military, family members, reservists, retirees, and Department of Defense civilians are connected to the base. John Prue is the Installation Program Director for MWR/Lodging. Reach him at john.prue@navy.mil .